Famous Forsyths — Clan Forsyth Society U.S.A.
Robert Forsyth, was born in Scotland in 1754 andsettled inFredericksburg, Virginia in 1774. At the age of 22, Forsyth enlisted in the Continental army after the start of the Revolutionary War. Three years later, on January 10, 1779, he received a commission of Captain in the corps of Partisan Light Dragoons (Lee's Legion) under Major "Lighthorse Harry" Lee. On September 25, 1789 George Washington appointed Robert Forsyth as the first U.S. Marshal of The Republic of Georgia. Forsyth conducted the first U.S. census for Georgia in 1790. On January 11, 1794, Marshal Forsyth, while serving acivil court process on two brothers, Beverly and William Allen. Beverly Allen, a former Methodist minister from South Carolina, saw the Marshal approaching, and hid in a room on the second floor of the house. When Forsyth knocked on the door of the room, Allen fired his pistol at the direction of the knocking. The ball hit Forsyth in the head, killing him instantly. He was the first of over 200 Marshals and deputies killed in the line of duty. 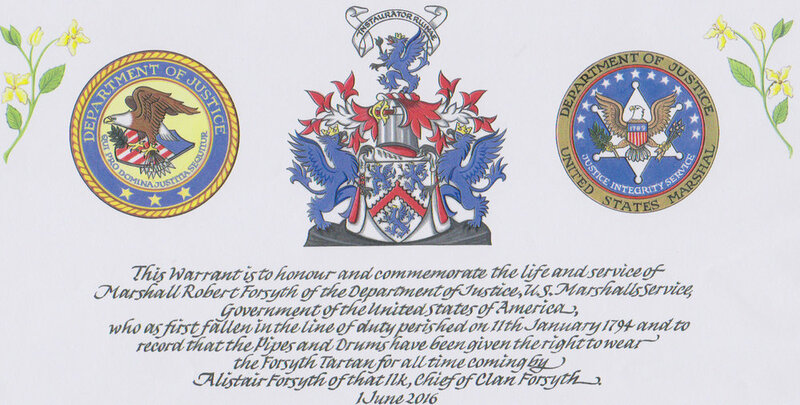 In May 2016 The U.S. Marshal’s Office sent a formal request to Alistair Forsyth of that Ilk asking for permission, which was granted, to adopt the Ancient Forsyth tartan as the official tartan of the United States Marshal Service Pipes & Drums Band. The beautiful yellow flower, Forsythia, is named in honor of William Forsyth. Forsyth was gardener to the Duke of Northumberland at Syon House, Chief Gardener at Chelsea Physic Garden and later he was appointed gardener to his Majesty King George III at the St. James and Kensington Palaces. He was also the author of ‘Observations on the Diseases, Defects and Injuries Of All Kinds of Fruit and Forest Trees’ and ‘ A Treatise On The Culture and Management of Fruit Trees’. John was born Oct. 22, 1780 in Fredericksburg, VA. He was the son of Col. Robert Forsyth (see 1st U.S. Marshal killed in line of Duty) and Fannie Johnston. Congress voted Col. Forsyth’s widow a gratuity of $2,000, which she used to send John and his brother, Robert, to Princeton University. Robert died shortly after graduation, but John returned to Georgia and opened a law practice in Augusta. President James Monroe. One of his greatest feats while minister was the negotiation of a treaty cession in 1819 with the King of Spain, resulting two years later in the permanent acquisition of Florida, at no cost to this country. In 1822 he was again elected to Congress and served until his election as the 23rd Chief Executive of Georgia from 1827-1830. From 1830 to 1834 he was a U.S. Senator and then served as Secretary of State in the cabinets of Presidents Jackson and Van Buren from 1834 until his death on October 21, 1841. He is buried in the Congressional Cemetery. John Hubbard Forsyth, was the son of Alexander and Mary (Treat) Forsyth. He was born in Avon, New York, on August 10, 1797 and raised on his father’s farm in Livingston County, New York. He studied medicine, but never practiced in favor of farming. After the death of his wife, Deborah Smith, in 1828, he left his only son, Edmund Augustus Forsyth, with his parents and moved to Kentucky before going to Texas with a volunteer cavalry company which eventually arrived at the Alamo with William Travis’ group. He attained the rank of captain in the Texan cavalry and was 38 years old at the time of the battle. He was third in command at the Alamo, only outranked by Travis and Bowie. Rev. Alexander Forsyth succeeded his father James Forsyth as the Reverend of the old Kirk of Belhelvie in 1790. He was a tinkerer, with a fondness for smithing and like most Scotts of the time, he also had a fondness for bird hunting. He had a problem with the flintlock rifles which had been in use since the 1600’s. They were unreliable and had a tendency for misfiring and the flash from the gunpowder before the shot went off, scared the birds away, so he set about to solve the problem and invented the percussion lock which he patented in 1807. In 1997 when Mom and I hosted our first Clan Forsyth booth at the Dunedin Highland Games we became aware of Matthew Forsythe. We knew that Dunedin, Florida had a long Scottish history and that both their junior high and high schools had bagpipe bands. What we didn’t know was that a Forsyth was behind this. Inside our games program we found the story of “How Dunedin Became A Mecca For Pipes and Pipers”. In 1957 when a new junior high school was built, it was named Dunedin Highland Junior High (now Dunedin Middle School) to honor the Scottish settlers of Dunedin, Florida. A reporter attending the opening ceremonies worked for a newspaper owned by a Scottish Lord, Roy Thompson. A request was made that Lord Thompson donate a set of bagpipes to the school. Several months later, after a slow trip from Glasgow to Baltimore and then to Dunedin, Florida the bagpipes arrived and were presented at a school assembly. Those accepting the donation vowed, with tongues in cheeks, to play “Danny Boy” on the bagpipe, just as soon as they learned which opening they were to blow into. This is when Matthew Forsythe appeared on the scene to teach them how to play the bagpipes. This convinced them that they needed more bagpipes and the fundraising began. The pipe band tradition for Dunedin, Florida began to grow. Today the middle school, high school and the city of Dunedin have their own pipe bands.These bands have traveled all over the world and won many awards. They owe it all to our very own Matthew Forsyth. Who was Matthew Forsythe? No one seemed to know. We framed the story found in our program and displayed it in our booth at the next Dunedin Highland Games. Paula Argyros of the Dunedin City Band came to us with more information. Paula was one of his first students and had many fond memories of him and generously donated several photos of Matthew and a book “Dunedin…thru the years 1850 to 1978 and 1988”. From the book we learned that Matt Forsythe was from Scotland and had been given the first “Delightful Dunedin Award” by the Dunedin Chamber of Commerce in 1966. We made a few inquiries at the school and to some of the people involved with the highland games, but no one seemed to know much more about him. At our annual Forsyth Christmas dinner in 2006, Stephanie Scott suggested that we have a Forsyth Florida mascot. Over the next few days I worked on creating a drawing of a Forsyth Florida Piper and then before our first highland game of 2007 I build a three foot wooden model of our new Forsyth Florida Piper and surprised everyone. We quickly decided to name him Matt in honor of Matthew Forsythe. Matt, of course, wears the Forsyth tartan, but in keeping with it being Florida, he wears tartan shorts instead of a kilt. My growing desire to find out more about Matthew sent me on a more detailed search. With the aid of Ancestry.com I was able to find a Social Security death record for Matthew Forsyth. This told me that he was born 25 May, 1902 and that he died in December 1972 and had applied for his social security card in Michigan. Next I made a search of the 1930 census for Michigan and found a Matthew Forsythe living in Detroit, Michigan. Both he and his wife were born about 1902 and were from Scotland. His wife’s name was Elizabeth and they had a daughter, Margaret P. Forsyth who was almost three years old. Could this be our Matt? At the 2007 Dunedin Highland Games I posted a note asking if anyone knew Matthew and could confirm who his wife and children were. No one had any information, so I could only assume this was correct. The name matched, the age matched, the birth place matched and the location fit. Later while doing genealogy research in the Tampa Tribune for my own family I ran across an article ‘MR BAGPIPES’ DIES.’ A gold mine of information found by accident! The article confirmed the birth date and not only that he was from Scotland, but was from Clydebank, Scotland. It also confirmed he had a daughter, Mrs. Jack Feredrick. It confirmed he had lived in Detroit, Michigan before he moved to Florida: first to Clearwater and then to nearby Dunedin. It also told me he was a piper for three years with the 6th Light Infantry Battalion. There was no mention of his wife, so I assume she preceded him in death. This spurred me on to look for more records and I next found a “Detroit Border Crossings and Passenger and Crew List”. This showed a Matthew Forsyth arriving in Detroit on 3 November 1923 at the age of 21. It also showed he was born in Clydebank, Scotland. Is this our Matthew? It seems so. The border crossing also told me his sister, Isabella, was living in Detroit and that his father, James, lived inClydebank, Scotland. I also learned he was 5 ft 8 inches tall, with brown hair and blue eyes and his occupation was electrician. Looking back on the 1930 census, who do I find living next door to Matthew Forsythe? Why it is Isabella C. Hunter! She and her husband Matthew Hunter are also from Clydebank, Scotland. Living with her is her brother, Malcolm P. Forsythe, born 1909 in Scotland. So Matt’s family continues to grow. With this new information I went looking for Isabella’s entry into North America and found that on 23 July 1923 Isabella Forsyth arrived in either Montreal or Quebec, Canada on the SS Metagama. The ship had sailed from Glasgow and her final destination was Detroit, Michigan. She is unmarried and a shop keeper. Notes show she will be joining a friend, William McDonald, and making Detroit her permanent home. She had auburn hair and blue eyes. Next I find Matthew Hunter crossing the border from Canada to Detroit 23, March 1923. He also mentions a friend by the name of William McDonald. Did Isabella and Matthew know each other from Scotland? Likely so, but they could also have been introduced in Detroit by their mutual friend, William McDonald. In 1936 on the 19th of September, Elizabeth Forsyth and her two children are shown crossing the border from Canada into Michigan. Her daughter, Margaret P. Forsyth was born August 1927 and son, Matthew A. Forsyth was born 1931. Her husband is shown as Matthew Forsyth . Her address is given as 14932 Steel Ave; Detroit, Michigan. Elizabeth is 5 feet 2 inches tall, with a fair complexion, brown hair and grey eyes. This record slightly disagrees with the 1930 census in that it says she was a 9 year resident of Detroit and the 1930 census says she immigrated in 1922. Maybe she entered the US in 1922, but became a citizen in 1927. Then in 1939 Matthew and Elizabeth are found returning to the U.S. from Glasgow. Both are 36 years old. He is listed as a refrigerator engineer and she as a housewife. They both have U.S. passports issued November 1938. They live in Detroit. Continued travel from Detroit into Canada and back to Scotland indicates that they still have relatives living in these countries. My next quest was to find Matthew, Isabella and Malcolm’s family in Scotland. I located the 1901 Scotland census. Although this was before Matthew and Malcolm were born I found a family living in Clydebank, Dumbartonshire, Scotland that seems to fit. James and Jeannie G. Forsyth have two children in 1901. Isabella C. (we know he had a sister by that name) and Elizabeth. This census also tells us that Jeannie’s mother, Jeanie Laughland is living with them and that James was born in Rutherglen, Lanarkshire about 1876. Well if Isabella, Matthew and Malcolm had come to the US, had the oldest sister, Elizabeth come also? Guess what? She had. April 1924 Elizabeth Forsythe, 26 years old is found crossing the border from Canada with a destination of Detroit, to meet her sister, Isabella. This record also mentions her father, James, in Clydebank, Scotland . Isabella is single and works as a cook. Now I was on a roll. If I could locate the family in 1901, could I locate them before that? I looked back to the 1891 census in Scotland for James Forsyth. From the 1901 census I knew James was born in Rutherglen, Lanarkshire, and there I found a 15 year old James and his father’s name was Matthew. James was a Mechanic apprentice. Is this our Matt’s grandfather and father? I may never be certain, but it sure fits. So far I have not located Matthew Forsyth(e)’s grave. I suspect it is in Michigan, since the Tribune article said he died there while visiting his daughter. I would love to locate the descendants of Matthew Forsyth to let them know he is not forgotten and to confirm the information I have put together on him. If you know of this family or have any suggestions, please let me know. NOTE: Some documents show Matthew’s last named spelled with an “E” and others without. I have used it here as I found in these documents. Shortly before publishing this story in "The Griffin" newsletter, Marsha received an email from his family who had discovered the family tree she posted on Ancestry.com. His daughter, granddaughter and a grandson were able to join them at the next Dunedin Highland Festival and many of his old students were happy to visit with them.